Howdy from back-from-the-mountains | arlette knits. For the last couple of years, if a band I like is playing somewhere interesting, I’ll pick up a ticket and plan a cheap vacation around it. Airfare is easy if you pack light, and distances seem short when you’re from California, a state that takes days to drive across. So that’s how I ended up in Laramie, Wyoming last month to see Iron & Wine and Gregory Alan Isakov. I spent a few days first in Fort Collins, Colorado, nursing a cold before I headed up to Laramie. On the way back down toward Denver, I swung by Gypsy Wools in Boulder, which carries print copies of Flatirons, and saw their store sample on display. 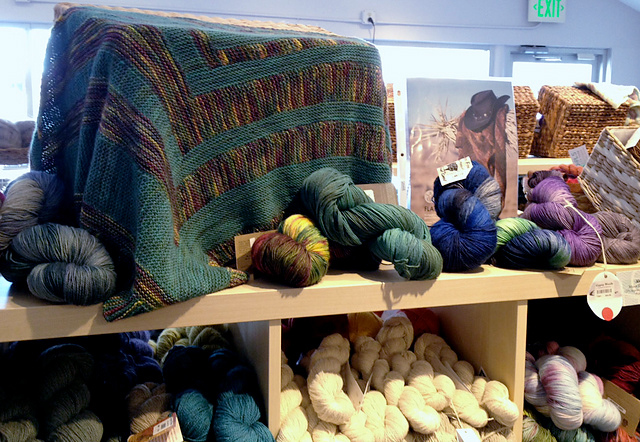 Flatirons store sample at Gypsy Wools – See it on Ravelry! The last time I’d been in the store, it was still in progress, but this time it was hanging right there in the store, next to one of the print version of the pattern. I *think* I managed not to hop from foot to foot with excitement when I saw it, but I was definitely glowing when the owner, Barb, shook my hand and told me they’d sold out of the pattern. I’ve really got to work on my habit of getting squeaky-excited and holding both hands to my mouth when cool stuff like that happens. I left with a light step and a slightly lighter wallet, thanks to my “I don’t buy souvenirs, but local things I can’t get at home don’t count” policy. That’s why I underpack my luggage by a few pounds on the way in, and make up the difference in yarn, whiskey and local beer on my way back. I packed 10 pounds under the 50-pound limit on my way in, and made it up for my flight back in local whiskey, beer and yarn. I am seriously pleased with myself.